With the release of Version 8 in September 14, XLCubed can connect to SAP HANA databases using MDX. This feature is licence dependant and requires the HANA connector. Firstly, you will need to install the SAP HANA MDX provider. Please consult with your IT department to obtain this. This will have to be installed on the Excel clients and the XLCubedWeb server. 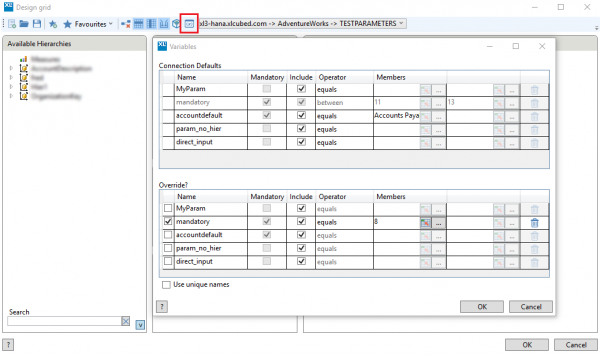 From XLCubed, select the SAP HANA connection type in the new connection form. You must then fill in the server name or IP address and instance number. Usually you will need to enter a name and password, if so tick the "Requires Logon" box. 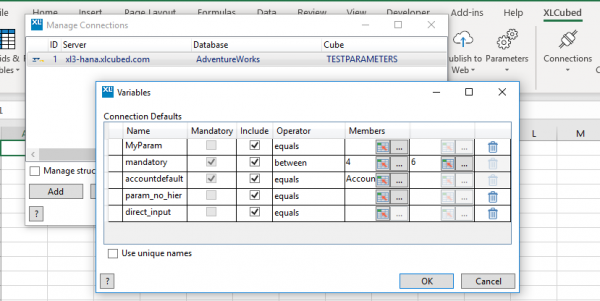 These are similar to the options found when using pivot tables, see the section on Excel Style Advanced Selections for more details. If you have Variables defined in your HANA model the values for these can be set using XLCubed. Connection - These are the default Variable values for Grids/Slicers etc. Object - Grid/Slicer/SmallMultiple value for the Variable, overrides the connection setting. Connection level values are set when creating or editing a connection in the Connections screen. Object level settings are set in the designer for the the report item, e.g. for Grids there is a toolbar button to edit the Variable values. Due to limitations in the MDX support of the HANA database engine some XLCubed features are not currently available. 'Advanced' Ranking Filtering and Sorting within a hierarchy are not currently supported for HANA connections. Instead XLCubed supports a number of pivot table like operations, accessed by right-clicking a grid member and choosing the "Apply" menu option. This is not currently supported for HANA connections. These are not currently supported for HANA connections due to restrictions in the supported MDX. Grids connecting to HANA cannot have in-cell charts defined as an interactive part of the grid. Standard formula based incell charts can still be used on data retrieved from HANA through a grid or XLCubed formulae. These are not currently supported for HANA connections. Member Selector options to "Group members", "Create Set" and "Calculated value"
Grid options to "Keep and Group members" and "Keep and Create Set"
- Note that standard Grid calculations are not affected and ARE supported for HANA connections. The option to create a table based on HANA connections is currently disabled as HANA does not support the MDX generated. These are not currently supported for HANA connections as HANA does not support the Mdx generated. This page was last modified on 8 April 2019, at 14:41.